This review of Woburn Sands and Aspley Heath news from 1900 was gleaned from our local papers. It was originally published in 2000, as a special edition Woburn Sands Council Newsletter. One of the local football teams, Woburn Sands Albion, went to Wolverton to play against London and North Western Railways Reserves in the Bedfordshire and District League. Unfortunately, Albion were “…one or two men short” (!) and they lost 4-0. At St. Michaels, Miss Tyler gave 20 hymn books and Mr Allnutt of Edgebury gave 20 revised Bibles for the use of the Choir Boys. Offitories for the last two months amounted to over £59, which included £24 for the Transvaal War Fund. Alfred Batlin left the village to rejoin his regiment, The Lincolnshire’s, to go to South Africa for the Boer War. Arthur Clayden and David Prickett (both reservists) left their jobs at Woburn Abbey stables to join the 2nd Dragoon Guards. They were accompanied to the Railway Station by The Woburn Sands Brass Band and seen off by a cheering crowd. 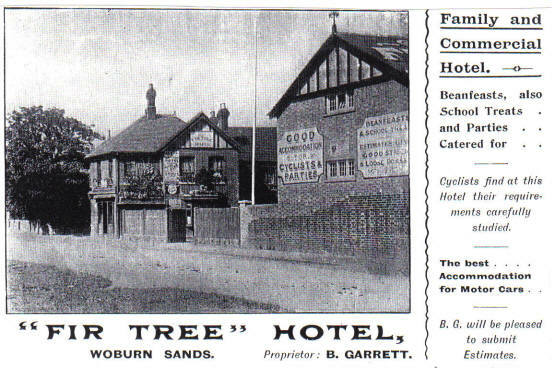 Woburn Sands was in the grip of an influenza epidemic and “…sickness in general is very numerous”. The Society of Friends held a Limelight lantern show at The Friends Meeting House with pictures from the War. Frederick Down, a local business man, provided a supper for the Choir boys at the Vicarage. The Rev. R F Appleby “…gave a thrilling address” to the Wesleyans at a public tea given in the School Rooms, on the subject of “Foreign Missions”. Mrs Appleby had been killed by the Boers at Joberg. Death: January 11th at “Velindre”, Woburn Sands, of Mary, the eldest daughter of the late Richard Veale Mingy, HMSO, in her 90th year. Mr Harry Emerton, of Woburn Sands, had received a letter from his brother, Joseph, serving in South Africa. He was fighting with the Volunteer Force, and was currently at Cheivieally Camp, safe and well, although he had been in heavy fighting with the 13th Hussars and pinned down for a whole day with no cover, just 4-500 yards from the enemy. He also said his own khaki uniform stands out too well against the black earth there. Mrs Sharratt, at Bedford, had received 2 letters from her son, Trooper Perry, who used to live at Woburn Sands for many years. He had met up with several Bedford School old boys in South Africa. One, called Lewis, he had to rescue from the battlefield on his own horse, and another, Carrier, son of a schoolmaster at Bromham, had 2 horses shot out from under him and then the third shot in the eye, luckily incurring no injury to himself. Woburn Sands played football at home against Bedford Montrose this week but lost 3-0.The local team is listed as: Clarke (goalkeeper), Soddie, Dolton, Hebbes, Branston, Tyers, Barker, Templeton, Mordaunt, Butcher and Giles. The local village doctor, Dr Robert Lewis Brander, who lived at “Woodfield” in Weathercock Lane, was the centre of attention at an evening staged to present him with an award for a very brave deed. In November 1899, a well digger, Samuel Dolton, was working at the bottom of a well in Crawley Church End, when it caved in on top of him, at about 4pm on Wednesday 23rd. Dolton had been entombed for 30 hours when Dr Brander said he believed he could still be alive. The Dr. climbed down the shaft as far as he could, ignoring the danger of a further collapse, and made contact with Dolton. Extra effort was now put into digging out the earth, two tons of which had to be removed for every foot dug down. Dr Brander stayed in the shaft until 8.30am Friday trying to tend to the trapped man. Unfortunately, Dolton died before he was brought to the surface. Dr Brander was presented with a framed Certificate of Thanks for his efforts and also a purse containing £32. 3s which had been collected from 127 subscribers who had also signed the certificate. The Duke of Bedford, who owned the land where the accident had happened, had set up a pension of 10s. a week for life for Doltons widow and also paid off her £35 mortgage. Another unfortunate accident, although this one was a little less serious: Jesse Varney, of the Leys, employed at the Fletton Brick Works, met with a nasty accident on Friday last whilst engaged working on a ladder, by some means losing his footing with the result that he fell heavily to the ground. After being medically examined one of his legs was found to be broken. Woburn Sands Albion travelled to Luton this week to play against The Luton Casuals. There was quite a fuss about the state of the pitch, it being very rough and in a terrible condition. The Casuals played very rough and “…were hooted by onlookers several times for their foul play.” Albion eventually lost 3-0. Not all were loyal to our Queen. And Britains sons will strike the blow. On the football front, the other Woburn Sands team, “The Excelsiors”, played the Bedford Queens Works Juniors and came away with a 1-1 draw, Barker scoring for the Excelsiors. Wood Street in the early 20th century, yet to be “made-up”. Mr Obidiah White had been called up from the Woburn Militia and was paraded to the station by the band. A collection was held for him on the way down from the Square. Mr Albert Leadbetter had received a letter from his brother, a Lance Corporal with the 2nd Royal Lancasters, in South Africa, where he was stationed at Springfield Camp. He had just taken part in the Battle of Spion Kop, and says the Boers fire on the Red Cross flags and hospitals, and use explosive bullets which are supposed to be outlawed. He says it is a bloody war with arms and legs lying on the battle field and trenches full of wounded. On St Patricks Day this lent. Come once more in peace again. Only 6 Albion players turned up at the station to go to Arleslley, so the game was cancelled. A letter from Lance Corp. G. Leadbetter, of the 2nd Royal Lancs. 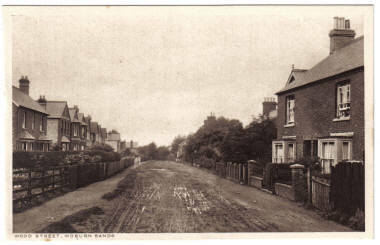 has been received by Albert, his brother, in Woburn Sands. He says, “I am still on the face of the earth and am doing all right, but how long I shall be so, I am not prepared to say…I have had quite a few narrow escapes from Boer shells….We have been under heavy fire, but are getting used to it. Spion Kop was awful. The General said that was about the most withering fire troops had been in. If we could get them into the open, the Boer war would not last long. Kindly give the magazine of Boer cartridges to P.C. Cumsty.” The Lance Corporal also sent back part of a “Long Tom” artillery shell to his family. Woburn Sands Albion Football team travelled to Bedford to play against Bedford Queens Engineers. The Albion were without many of their usual team and took a thrashing of 10-1! Woburn Sands was the venue for a ladies hockey match between Wavendon and Bedford. The Bedford Ladies won out victorious 3-1. Mr Sharp and Mrs Cheetham, of Aspley Heath School, had organised a collection of 666 pennies from 174 children to be forwarded to Bisley for the building of homes for injured soldiers. Mrs Inwood, the wife of the late Charles Inwood, of “Hepworth Villa” Woburn Sands has died aged 72. She lived in Woburn Sands for the last 50 years and was the leader of The Wesleyan Society Class for 25 years. She was buried in the graveyard behind the Friends Meeting House. Newport Pagnall made the trip to Woburn Sands to play football, verses The Albion, and won 1-0. A return match was played on Easter Monday when Woburn Sands fielded a very weak team and lost 12-0! The team responsible for this disaster was Webb (Goal), Clark, Chapman, Randel, Jackson, L. Salmons, Clarke, Griffin, F. Jackson, H. Barker and W Baker. Lance Corp. George Leadbeater sends another letter to his family in Woburn Sands. He hopes by the time they receive it, Pretoria will be under the British flag, and Paul Kruger under the soil! He recounts how he saw a Boer fire five shots point blank at an English soldier, all of which missed, and then tried to surrender, saying he was English and was sick of the war! The man he had fired at ran him through with a bayonet. Mrs Wodhams, of “Treelawn” Woburn Sands, has been collecting clothing and presents to send to our troops in South Africa. She has collected 9 flannel cholera belts, 9 flannel shirts, 6 pairs of knitted socks, 13 wool mufflers, 35 cup covers, 6 knitted cholera belts, 2 splint bags, some note paper and envelopes, 3 helmets, 2 Tam’o Shanter hats, 18 pipes, 1 pipe lighter and 4lb of tobacco to send to Mafeking. Mr Barrett, the Station Master at Woburn Sands is to retire after 40 years with the L&NW Railway, the last 20 of which he has spent at Woburn Sands. He will continue to live locally and is remembered as being most courteous to all. A lady out cycling with her friends in Woburn Sands woods, was unable to stop after coming down the track which leads to the exit by The Henry VII Lodge. Unfortunately, the five bar gate was closed, and she hit it with some force and flew through the air, somersaulted and landed the other side. However, she was unhurt and cycled on, much to the amazement of onlookers. “Motors -This village was full of animation on Saturday last, on the occasion of “The 1000 Mile Motors Trial”. Large numbers of people came from the surrounding district to witness the long procession. The first to arrive was The Hon. C. S. Rolls soon after 12 noon, the others following at frequent intervals until 6pm. Mr Cecil Grimshaw, a local gentleman, was the recipient of an outburst of cheers as he rode through the village about 4 o’clock. A mishap happened to one of the cars when passing through, the tyre bursting, and a new one had to be adjusted. The explosion was heard a long distance away. Helpers were soon at hand and rendered assistance. The motor was detained about an hour but nevertheless was one of the early arrivals at Whitehall. About 60 cars passed through the village.” The cars were on a stage of the race from Coventry to London. John Whitbread, brickmakers labourer, age 53, of Aspley Heath, was charged at Woburn Petty Sessions with neglecting to contribute to his fathers maintenance. His father was receiving 6s a week from Ampthill Parish. Prosecution said as Whitbread earned £1 4s a week, he should help more. The defendant insisted he only earned 16-18s a week and had many overheads. The court ordered him to pay more. Mr T. Gregory, of the Swan Hotel, applied for an extension for an extra hour, 10pm to 11pm, in order to hold a smoking concert to celebrate the birthday of the Queen. The news of the Relief of Mafeking was announced in this district at 11.30pm on Friday by Mr Grimshaws cannon being fired in Aspley Guise. People took to the streets to celebrate although the really big parades followed on Saturday night. Woburn Sands Brass Band led more than 2000 people in patriotic singing, from the top of Aspley Heath, all around Woburn Sands with more than 100 blazing torches. There were speeches from Mr H. Mallan of “The Dene” and Mr T. Gregory and the burning of an effigy of Paul Kruger. Five windows were smashed at Mr J. Turneys house in Aspley Guise, by a mob who believed he was a Boer sympathiser. All the local children were given Monday off school, and Edith Poole submitted another of her poems to the paper. A committee has been formed to arrange the peace celebrations which were expected at any time. Subscriptions are being sought. The new Recreation Club was officially opened by the Mayor of Bedford, Mr Hedley Baxter. The Rev. C. R. Dickinson had approached Mr Frederick Down last year, and secured premises in Russell Street on a lease for 7 years at a very favourable rate. Now this building had been refitted and was to be the new Social Club. The club had borrowed money to fit it out with furniture and a full size billiards table. There were about 40 members of the old club. There was a Quaker wedding at the Friends Meeting House this week between Mr James Austin Bayes and Miss Mabel Lissie Horton, daughter of the late Mr W. Horton of “Ferndale” Woburn Sands. The ceremony is commented on as being unusual because there is no “Obey” part to the brides lines as Quakers consider women to be equal. Horton and Bayes were well known in the area as a chemists business. Dr Jason Wright Grant, practicing physician and surgeon of Woburn Sands had sued Walter Joseph Smith, the postman of Woburn Sands for an unpaid bill of £ 9s 6d, for attending his wife and child. Dr Brander appeared as a witness, as he was the assistant to Dr Grant. The court ordered Smith to pay at 4s a week. A large party of cyclists visited from Northampton Working Mens Club and passed an enjoyable day. Mr W. Bliss, a corn merchant of Wavendon, fell from his cart outside the station, when his reins broke. He received slight injuries to his side. “Novel Invasion of the House of Commons – On Wednesday afternoon, a clergyman, wearing among other things, a broad smile and followed by a train of no fewer than 25 plump young gentlemen in Eton jackets, white collars and straw hats resplendent with blue ribbons, presented himself at the strangers entrance to the House of Commons and asked to be admitted. The constable at the door stepped back a pace, speechless with amazement. Mastering his emotions, he inquired feebly as to the nature of their business. Then one of the young gentlemen stepped forward and explained with some hauteur, that his school had come up from Woburn Sands on the invitation of his grandfather, Mr Lafone, the member for Bermondsey.” The group was from The Knoll School in Aspley Heath, led by either Archdeacon Miller or Rev. Hort, who were partners in the school. As well as watching a debate, the MP showed them around the Lords, and treated them to afternoon tea on the terrace, much to the disgust of fellow MPs who complained and said he was setting a precedent. “Unusual, perhaps,” said Mr Lafone, with a teapot in one hand and a plate of muffins in the other, “but it was my grandson’s suggestion, and I could not refuse. They’ve seen everything. Tired? Not they! They’re going on to the British Museum” he said before hurrying away to attend legislative duties. Lots of day trips and picnics took place for local groups. The Congregationalists had their Annual Tea, at the Fullers Earth Lodge, on Woburn Road. They concluded their day with team games, such as baseball, and singing the National Anthem. The St Michaels Sunday School had a day at Mr Roberts meadows at Lidlington, with scholars, teachers and parents attending. Mr Down provided a pony to give the children rides. The Temperance Movement had an outing to Yarmouth, and also went on a trip to Blackpool and the Lake District, while the Church Choir went to Brighton, and the Communicants Guild went off to Wrest Park gardens to play cricket. Woburn Sands must have seemed empty some days! A Litany desk was presented to St Michaels by Miss Wilkinson. It had been made by the same firm, Mr Forsyths’ Works, who made the lectern, in order to match it and the pulpit. Frederick Goodall was summoned by Fenny Stratford Petty Sessions, for disobeying a vaccination order on his child. He claimed the child was not fit enough for it. The case postponed one month. At the AGM of Woburn Sands Albion Football Club, they found they were £3 7s 6d in the red, but this amount was covered by their assets. They had not had a good season this year. With Mr McMurtrie, the local cabinet maker as Secretary, they decided to join the Ascott and Bedford leagues for the new season. Joseph Emmerton, away in South Africa with the Imperial Light Horse, has written again to his brother in Woburn Sands. He says he was the first trooper into Ladysmith when it was relieved. He was then transported aboard the ship, ‘Urmstone Grange’ to Cape Town, and from there to Kimberley. Here his regiment joined two others, and were travelling 30 miles a day on half rations for man and horse alike. He took part in the relief of Mafeking, and remembered it fondly, as he captured half a sack of grain from the Boers, and was able to make his own bread! Mr William Pickering, of Wood Leys Farm, had 14 of his sheep killed and injured when they strayed onto the railway lines, near the station. There were 216 in the flock, who had got onto the line, possibly though the gate to Flettons Brickworks being left open. They were struck by the 1.00am goods train. It was considered a miracle that more weren’t killed. About 50 residents of the area enjoyed a trip to Stockgrove Park, for the annual gathering of the Primrose League, a Conservative political association. W.A. Hebbes, the son of the Verger and Sexton at St Michaels, has been commanded to the Cape of Africa, to join HMS Doris, to assist the Chief Engineer to inspect all transport ships. He left on the SS Scott for the 15 day journey. The Rev. Charles Inwood has returned from his visit to India to preside at the memorial service for his mother. He says he saw a bed in an Indian hospital, with a plaque engraved with the name ‘Woburn Sands’. On asking, he found it had been funded with the generosity of Mrs Stuart of Woburn Sands. There were 6 candidates for the 4 seats available on Aspley Heath School Board: F.W. Down, the local businessman, N. Sturges, E. Boyes, a draper, F. Wingrave, grocer and wine merchant, J. Elliott, another draper and W. G. Hall. After the election, it was found that about 100 local voters had been left off the electors roll, as they were not in the rate book. A petition was raised to demand another election. After an investigation, it was found to be the fault of the overseer and collector, Mr King. He admitted not keeping the rate book up to date, and apologised. Sturges, Down, Boyes and Elliott were elected. Later, Mr Miller, who was already on the board, objected to the election of Mr Boyes, as he had been elected under the name of Edward, when his real name was Arthur. Mr Miller ran the local printing works. Advice was sought from the Board of Education, but they declined to intervene. The chairman said the matter should be dropped. Miss Annie Ethel Taylor of Hardwick House had married Mr Joseph Charles Jeanes of Eastbourne. The happy couple went to honeymoon in Cromer. Another local couple of newly weds, Miss C White and Mr G W Young were off to spend their holiday in Margate. A large garden party was held at Daneswood, on the Heath, the private residence of Rev. Canon & Mrs Bartlett, with over 100 guests attending. The Rev. C. R. Dickinson has decided to take the Duke of Bedford up on his offer of moving to the Woburn Church. He has been at Woburn Sands for less than a year. The Aspley Guise and Woburn Sands Cottage Garden Show was held on land between the two villages, owned by Cecil Grimshaw of “Woodcote”. Two large marquees were erected for the show, and The Luton Red Cross band were engaged to provide the music. The Judges and officials were treated to lunch at The Swan by Mr Gregory, the landlord. They were not sure if this was the 29th or 30th Annual village show. About 200 prizes were awarded, not only for plants, vegetables and gardening, but also for cookery, lace making and knitting, etc. It was commented on that the village was very full of daytrippers, taking advantage of the Bank holiday fine weather, and that all available letting apartments had been taken up. Woburn Sands hosted a very successful cricket match against Lidlington, which we won by an innings and 54 runs. All the local employees from the local depot of Phipps and Co, the Northampton brewery firm, had a day out to Yarmouth. The employer generously gave each employee two tickets. They went by train, which took 2 hours. Mr George Andrew, the well known local pianist, has left for Harrow. He will be sadly missed, as he always played with great skill at local dances and parties. A great number from the town went on a trip to Bellevue Gardens in Manchester. The journey by rail, took 8 hours. The new minister at the Wesleyan Chapel is the Rev. Percy Pegler, who replaces A. Brooks. At St. Michaels, Mr Frostick, the lay reader, has given a set of 5 Alms bags, embroidered with the sacred monogram, whilst Mr Plater has given 4 Swiss landscape pictures to liven up the billiard room at the Recreation Club. Mr and Mrs Stephen, of Manor Farm, Wavendon, hosted a tea for all the women in the district who were over 50. The Woburn Sands Band attended. The top of the shaft of the Fullers Earth Mining Co. Lot 1: ‘Glenside’ Aspley Heath, residence and grounds, started at £800 and went to £1400, sold to JL Allen. 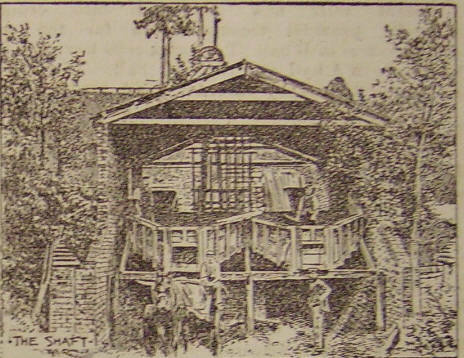 The Statute Fair was held in Mr Roberts’ field, with Swinging Boats, Shooting Gallery and Coconut Shy to tempt fair goers. Aspley Heath School Board is looking to train pupils to be teachers, as only one of the current teachers is a local person. Woburn Sands Albion played Bedford Albion, in one of their first matches of the new season. Woburn Sands had changed their strip from white to red, but perhaps this was unlucky as they were beaten 3-1 after being 1-0 up. Two weeks later they lost again to Stony Stratford Town 2-0, at our home ground in Theydon Avenue. Someone in Simpson, who signed himself ‘Fair Play’ wrote to the paper to complain about the smoke nuisance from the brick chimneys at Woburn Sands. He wanted to know if perhaps nothing had been done, as the owner of the kilns was also the Chairman of the Urban District Council?! Mr Henry Summerly, the local cooper and furniture dealer has died, aged 78. The company had gone broke, and the equipment was also auctioned off, including a 25hp horizontal engine and boiler, winch-winding machines and grinding mills. There were also steel tram rails, turntables and mining wagons, as there used to be a short tramway on Aspley Heath, to get the dug earth to the refining buildings. A description of the works in 1896 says the company employed 24 men, of whom 8 worked in the underground mine. Alfred Payne was charged with stealing live fowls, worth 2 shillings, from Thomas Garratt, but the case was dismissed. The Albion football team raised some much needed funds, with a smoking concert held at The Swan, chaired by F.W. Down. John Summerly, a carpenter of Aspley Heath, was fined 5s and 5s 6d costs for being drunk and disorderly at Aspley Heath. The death is recorded of Mr Robert Bailey, of Mill Farm. He had run the Weathercock Inn, in Woburn Sands from about 1854 to 1891, before retiring to the farm. He had had a stroke two years before, and was buried at Wavendon church. Football news was mixed this month. Linslade St. Barnabus came to play against the Albion. Although fielding a weakened side, Albion scored two goals in each half, and won their first game of the season 4-0. Barker, Butcher, Popple and Giles were the scorers. In the next match, away at Fenny Stratford, Albion were defeated 2-0 on the Park Hotel ground. Albion were in action again, going to Wing. There was a mishap with their horses on the way to the match and the game started half an hour late. Consequently, the match ended after darkness had fallen, and several players had begun to lose their tempers! We won 3-1. The Harvest Festival at St. Michael was well attended, with the ex-vicar Rev E. H. Mosse coming from London to preach. £8 19s was collected, and divided between the good causes of the Bedford Infirmary and Hunstanton Convalescent Home. The Liberal candidate for North Bucks. in the forthcoming election, Mr Beaumont, held a rally at the Institute. The meeting was chaired by H. S. Leon, owner of Bletchley Park. The Zenana Mission also held a meeting at the Institute Hall, with an interesting address by Miss Tooley, a missionary who had done work in China. Several vicars had been to look around the St. Michaels, as Rev. Dickinson was leaving to take the church at Woburn. However, they had all declined the post. A pair of horses attached to a carriage bolted down Station Road. They collided with Mr Buckmasters brick wall, and demolished it, and also hit Miss Garretts garden wall. The carriage pole was smashed and the carriage, which belonged to Mr H. P. Harris of Aspley Guise was considerably damaged. Miss Harris was actually in the vehicle at the time, but escaped unhurt. Mr Frostic, the Lay reader at St. Michaels, is leaving to take up a post at St Peters in Bedford. He had spent two years in Woburn Sands and was well known and liked by all. Mr Carlile, the newly elected member for North Buckinghamshire, came to the village to give his thanks to his supporters here. He was entertained at the Swan Hotel, and given three cheers by the large crowd who had gathered to see him. A special Council meeting was held, at which Mr Prothero attended as the representative of the Duke of Bedford. It was to officially draw up rights of way for the public to use His Graces Estate. Paths would be marked ‘Open’, ‘Allowed’ or ‘Closed’. Gates would be installed to admit invalids in bath-chairs for 6d a year, and the picking of wild flowers was to be stopped. The woods were now a major tourist attraction, and the village had a growing reputation as a health resort. Hundreds of visitors were coming to Woburn Sands for weekends and Bank Holidays and steps had to be taken to police the public areas, which were fast becoming overwhelmed. Duke Herbrand had closed off the woods in 1898, by nailing shut the gates and blocking the bridle ways, as people were stripping the woods of flowers and ferns to sell. These barricades were taken down by the locals, and six years of meetings and letters followed before the matter was sorted out. Alfred Hirdle has passed away, during his latest sentence in Bedford Prison, aged 49. The doctors said cause of death was ‘Profound Disturbance of the Brain and Apoplexy’. Mr Hirdle was infamous in the area, as his 59 convictions, mostly for being ‘Drunk and Disorderly’ bears testimony! He was originally from Ridgmont. Every landlord for miles must have breathed a quiet sigh of relief! Guy Fawkes night was celebrated in true style by the youths of the village, who lit tar barrels in the High Street. The Police were very dismayed that the youths carried on their revelries until midnight. Woburn Sands Dancing Class opened their season with a production of ‘Cinderella’, with about 50 present at the performance. In football news this month, Woburn Sands Montrose played Bow Brickhill, and came away with a 1-1 draw. Albions latest game against the C Springs of Leighton Buzzard ended in a 0-0 draw. The Albions also entertained Wolverton at home, but were very much off target and lost 3-1. Our goal was scored by a promising young newcomer, Thomas Barker. Later in the month, we won through to the second round of the Bedford Cup by beating Luton Buxton Rovers 4-0. Woburn Sands Excelsiors, who seem to have been the junior team, were beaten 2-1 by the boys at the Knoll School, Aspley Heath. The Recreational Club held a lantern show in the Institute, where Mr Robert Tindell showed ‘A night with Charles Dickins’. The Duke of Bedford had generously sent the club a cheque for £50, which not only cleared their outstanding debts, but left them £30 in credit. The Woburn Sands Orchestral Society has added a Chorus to their ranks for the new season. Their first production was ‘Bride of Dunkerran’ by Henry Smart, which was conducted by Mr W. Steff Langston and very well received. It was announced that Rev. Dickinson was to perform his last duties at St. Michael before being replace by Rev D. W. Henry, who was from Battersea. He would stay for 13 years. A dark day was had by the Albion when they were beaten 7-0 by a Stantonbury team. A better result was had by the Excelsiors, who went to play Salford Rovers and won 3-1.The Albions were forced to replay there game against Luton Buxton Rovers, to progress to the second round of the cup. The reason is not clear, but the score line was just as convincing as the last 4-0 victory. This time we won 5-1. Albion went on to meet another Luton team in the next round, Luton Boiler Works. These were dispatched 6-1. A lecture was given at the Institute Hall by Sgt. Hill of the Kings Royal Rifles, to raise funds for new buildings for The Woburn Sands and District Adult School. He showed limelight pictures of what the war in South Africa was like, and described his tour of duty there, and also his service in India, in graphic detail. He had been at Ladysmith. At one point, there was a disturbance in the room, as Sgt. Hill had made some comments which the audience did not find favourable, but the lecture continued. The comments were not reported, but perhaps the audience did not like the reality of what they saw after the heavily censored patriotic reporting by the national newspapers. The Society of Friends, also known as Quakers, announced that they would be replacing their old building in Hardwick Road with a new one, as the thatched building they had was too small. The first wedding had taken place on this site in 1660, a year after Quakers had been arrested for travelling to ‘Wandon Meeting House’ as they were using their horses on the Sabbath. The architects Usher and Anthony of Bedford were engaged to draw up plans, but there ideas were found to be ‘…out of harmony with Quaker ideals’, so W. Sharp of Ampthill was taken on. Fund raising was under way, and £800 had already been collected. 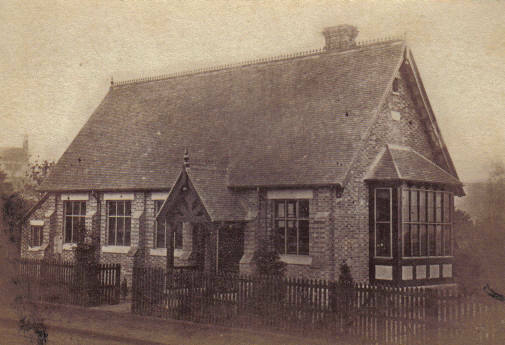 The new building would not be opened until 1901, and is now used as our branch of the county Library, of course. The Committee of the Recreational Club were forced to refund the ticket price to all those who had paid to see a lecture on ‘A Day in Newspaper Land’. The slides for the show had failed to arrive by train from ‘The Strand’ magazine! The old windmill at the end of Mill Lane, which has stood for as long as anyone can remember, was blown down during a heavy wind. It was a very picturesque relic, which attracted numerous artists to Woburn Sands to capture it in oils or water colours. A sale of handicrafts by eight Sunday School girls raised £12, which they sent to Rev. Mosse, to help with his work. The local MP, Mr Carlile was back at the Swan again, to meet his supporters. As a memento of the event, they presented him with a collar for his dog; ‘Sweep’ It came with a solid silver plaque with an inscription. 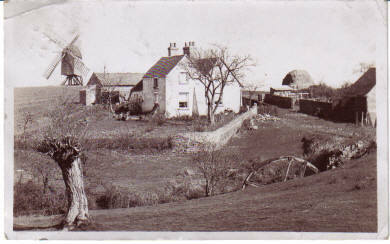 The mill, top left, that blew down, 1900.